The other day my mom bought a “beary” interesting bag at a department store in Osaka, Japan. Look! The blue color produces a cool atmosphere. This bag is lovely, especially for summer. 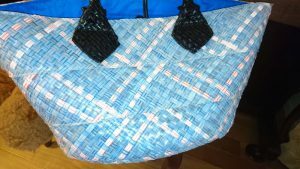 What do you think this bag is made of? 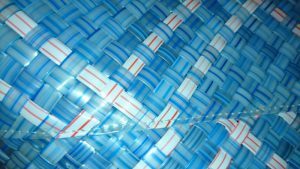 It is made of drinking straws. Congolese women washed used straws, dried them, and “transformed” them into a nice bag. Amazing! The straws which were destined to be thrown away have been reincarnated by creative and dexterous Congolese women! Fantastic! Garbage can thus be recycled, more precisely speaking, UP-cycled, into a more attractive and marketable product. Be Empowered with Available Resources! Let’s BEAR! 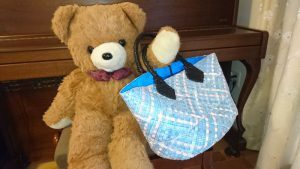 More “Let’s BEAR” bags made by African women are introduced in the following links. Click below!